I have been painting my nails for a few weeks - it is said to beat stress. While I fancy the look of artsy nails that I have seen online and in Japanese magazines - I am not that good. I am trying though and get a few happy compliments! 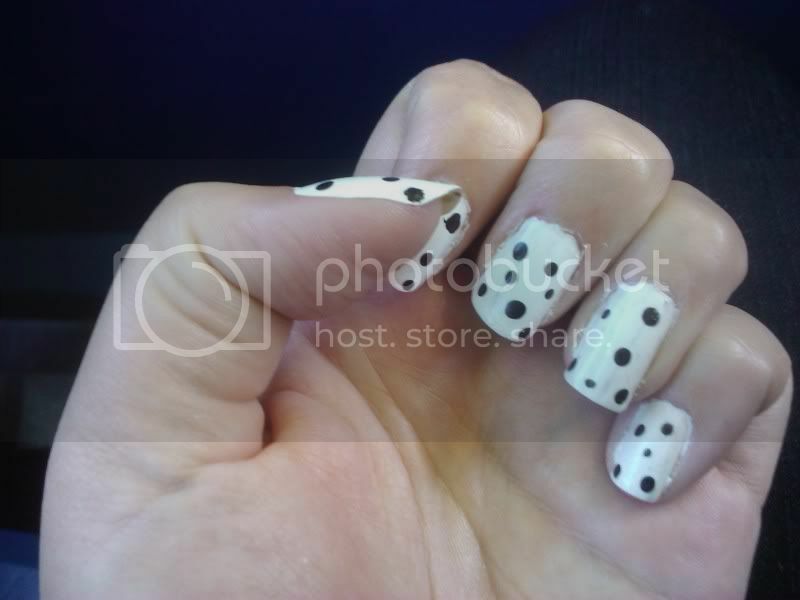 Tip: to create dots, use the tip of a bobby pin dripped in nail polish and dot away! I was using a polish remover that was cruelty free to my furry friends but it was cruel to my skin. My fingertips were raw! I had to slather on super thick hand lotion for days till things looked better. I picked up the E.L.F. polish remover pads thinking that they will not work...Boy was I wrong! I used them last night and they did the job using 2 pads and left my nails glossy and my hands not dry! For $1 pick these up now! Your nails look awesome, that thread on the PPK got me back into painting my nails after years of having a job where I wasn't able to wear nail polish. I love this! I want to do it. I rarely paint my nails, but this looks fun. Thanks for following me, Ms!